Before I rediscovered knitting I had another obsession – gardening. I would tend to my garden daily and grew all sorts of things from seed. And then the yarn came a calling and gardening slowly fell off my radar. I was still interested in plants, it just wasn’t an all consuming obsession. Last year I decided to rent the plot of land that backs onto my garden thus doubling the size of my garden. 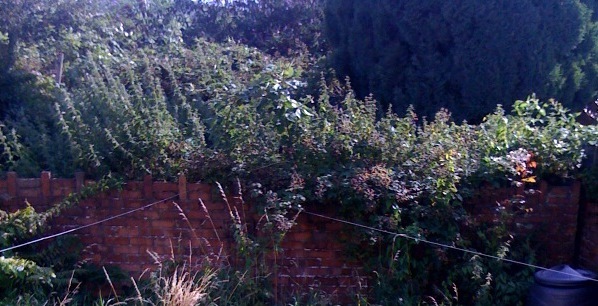 The plot had never been leased before and was thick with over grown brambles. 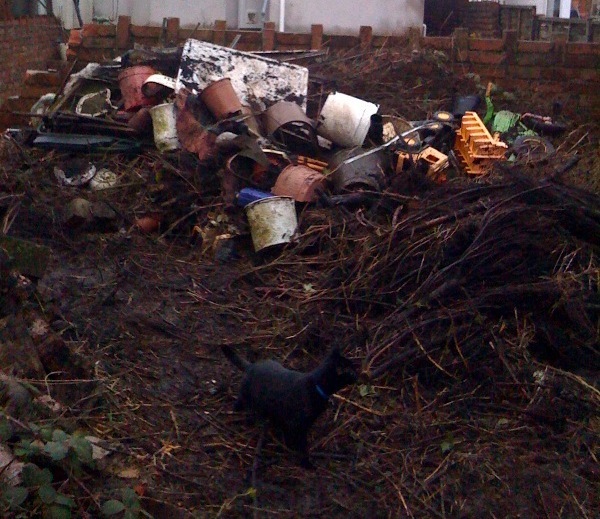 I hired a gardener friend in February and she spent two days clearing the worst of it and unearthed a lot of junk that had basically been dumped over the garden wall. The funniest thing she found in there was an unopened jar of picked onions! I had the rubbish taken away and have continued clearing the plot. 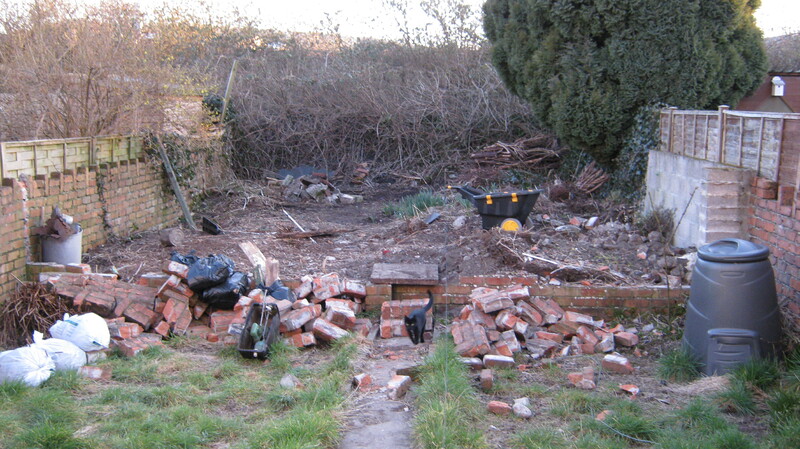 Doug knocked down the garden wall to unite the two sections. See that blue wheel? That belonged to a manual lawn mower that had been chucked over. I also found a toilet cistern and a rotary washing line. Slowly getting there. You can see the cistern on the left. I’m sure you will have noticed that Emma has been supervising the whole operation. It’s still far from finished and I don’t have a great deal of time to get some raised beds sorted so that I can get on with growing some veg – more on that later – but I’m posting these before and after photos not only as a record but as impetus to continue with the work. Doug and I spent several hours working on it on Saturday and most days I can get at least an hour done out there after work before the light fades. I do sometimes wish I had the overnight help of GroundForce but it’s slowly getting there!